BREAKTHROUGH BREAST CANCER: Certainly having written extensively about cancer in all its forms over recent years should have prepared me for the news that my better half delivered in May 2006. 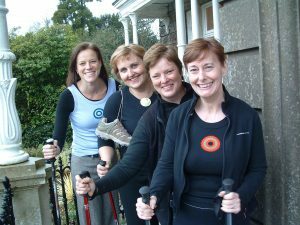 Two years of brutal treatment for breast cancer followed and Ros — accompanied by four friends, three from Beechwood Sacred Heart School in Tunbridge Wells and christened the ‘Beechwood Jets’ — flew off to Beijing in May 2008 to tackle the Great Wall of China raising about £4,000 each for breast cancer relief in the process. We don’t know what the next few years hold, but ‘Breakthrough’ is working hard with its vital programme of research and education so it can live up to its name. Listen to Ros talking to BBC Southern Counties radio before the expedition. The trip now over, Ros talks about her experience. 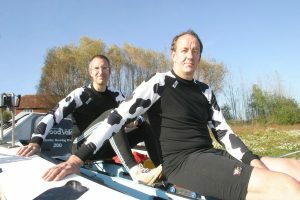 THE PARKINSON’S DISEASE SOCIETY & THE NATIONAL AUTISM SOCIETY: Between November 2005 and January 2006, Bewl Bridge Rowing Club’s Chris Andrews and chum Clint Evans from Molesey Boat Club – known collectively as ‘Team C2’ – rowed across the Atlantic Ocean from La Gomera to Antigua in an astonishing 51 days, 2 hours and 10 minutes. Rowing in the 2005 Woodvale Atlantic Rowing Race, they raised just over £19,000 – one hell of an achievement! But it’s not over, even now. These good causes still need support, so please donate whatever you can. Again – thank you.